Introducing the Happy Crocheting Yarn Drum! I think it’s fairly well documented that I crochet on the move quite a lot. My Instagram is littered with photos of me crafting on trains, I’ve written here before about my love of commuter crochet, it’s kind of just my “thing”! So I was over the moon to be sent the Premium Yarn Drum from Happy Crocheting to test out as my next crochet bag. Project bags are a big deal when you crochet on trains, planes and automobiles quite as much as I do. I need my bags to work for me. So without further ado, let me introduce you to the most practical and considerately designed project bag in my yarn bag arsenal. I knew I was a fan when I first opened it – the sheer amount of yarn I can store in the yarn drum is incredible. I love the cleverly designed holes in the top – they will allow me to use up to four balls simultaneously without a nightmare of tangles. The cleverly designed slits on the top of the bag are so useful. I love the long strap – this kind of thing is easy to overlook, but when you need to carry a bag all day, it’s so much easier to have it slung across your body than to keep readjusting it on one shoulder. The pockets at the front are a great touch – I love front pockets on all my bags, always finding something to go in them. Three specially designed hook holders are a highlight! I took the Happy Crocheting yarn drum as my yarn shopping bag when I went on the Great London Yarn Crawl earlier in the month. It was perfect! The size of the bag meant I was not only able to store 3 WIPs to work on throughout the day, but I could also shop without needing to carry an extra bag. This was on the way to the Yarn Crawl – it fits so nicely on the tray table on the train. My fabulous yarn bag swallowed up a big stack of fabric, my entire yarn crawl goody bag, some new yarn and even my scarf at some points of the day. It’s like a tardis. I got so many comments about the bag on the day of the Great London Yarn Crawl – it was much admired. Yarn as Hand Luggage – Why Not? I took the Happy Crocheting yarn bag with me on our recent trip to Belfast to see how it fared on a variety of modes of transport. Proof! The yarn bag posing on our balcony in Belfast! It worked nicely as hand luggage for our flights. Using the holes in the top of the bag is so easy when you have to put your bags under the seat in front. I then decided to rope Mr Elsie Pop in for a full day tourist test. We took in the Crumlin Road Gaol and took a tour bus around the city, with the Happy Crocheting yarn bag in tow. Inspired by the crochet seen in Alcatraz last year, I thought it seemed appropriate to take mine into a cell! The Crumlin Road Gaol is a really eye-opening and interesting tour – I’d highly recommend it. But we’re talking yarn bags! I “encouraged” Mr Elsie Pop to carry the bag for me during the tour, so that I could play photographer. He threw himself into the task. He’s available for modelling, by the way – I’ll act as his agent! It’s really comfortable to wear – despite its structured shape, it’s really soft and doesn’t dig in. The strap is just the right length for wearing cross-body too – as you can see! As Belfast is in Ireland, we did encounter a bit of rain! Luckily the bag is fully lined, so all of my lovely yarns were kept safe and dry. After the tour of the Gaol, we got on the tour bus. 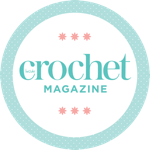 We had an hour and a bit to fit in a bit of crochet – I can’t tell you how great the bag is for acting as a yarn bowl – those clever openings at the top made it a breeze. We finished our tour around Belfast in the famous Crown Liquor Saloon – a pub which is just wall-to-wall inspiration. It’s famous for its intricate decor, with a tiled floor, carved ceiling, tiled bar, mirrors and carvings on the walls and something amazing everywhere you look. If you look behind all the drinks and the yarn bag, you can see some of the stained glass in this famous pub! The bag withstood a good dose of Irish craic in the pub to round off the day. I’m absolutely chuffed to bits with my latest yarn bag – it’s such a great addition to my crafting arsenal, I think it’s going to be used pretty heavily for a long time. I’d highly recommend it to anyone who crochets on the move. Disclosure: I was sent this item for review, and there are affiliate links in this post. As always, all of my opinions are genuine. Could be too big for some occasions?